PHILARTIS a écrit: Putain, ça lui va vachement bien cette couleur - c'est d'la balle ! Sérieux, j'ai toujours "évité" les light parce que je leur trouvais un look trop vieillot, mais comme ça elle me plait un max. Phil says he loves the color. He always found the Lightburner's design a little old school for his taste, but he really likes yours. 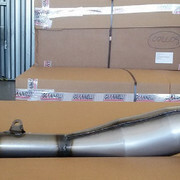 This is an exhaust for TZR 125 by Giannelli. I have find for 100€ new. Can in install on my TDR ? Has the TDR the Engine mounted with the same angle as the TZR ? Quite sure you will have to weld yourself your own mounting plates. Is it supposed to be bolted behind the rear brake pedal ? My Tdr R with 3MB00P and some slightly tuning . I need only a good exhaust! Mon 125 Lightburner de 1991 !